Having your carpets cleaned by Maas Carpet Cleaning service of Boise can make your floors look and smell new again. Dirt, oils and other outside pollutants will soil your carpet quickly, causing the rugs to wear out MUCH FASTER costing you THOUSANDS of dollars to replace. Top rated carpet cleaning Boise services– honest pricing since 1966. 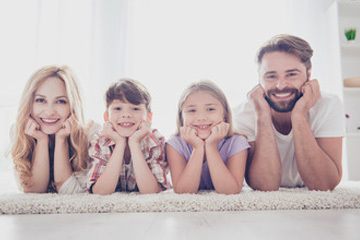 We use child safe and dog-cat friendly solutions that rinse clean and leave your carpet looking great with quick dry times! We completely remove the most difficult pet odors and spots permanently from your floors. We gently wash Oriental, Persian & Wool rugs at your home preserving antique fibers, leaving it vibrant and stain free. We walk through your house to identify spots or stains and accurately measure the flooring so we can give you a low rate price. Jim Maas makes sure you stay informed and engaged. We want you to be able to make decisions that may affect your carpet cleaning costs; pet stains/odor, ink, grease or other spots will be discussed. Pre-treat spots and stains. Pre-treat all areas to be cleaned if necessary. Allow time for the pre-spray to break down dirt and grime. Full hot water extraction (steam cleaning) using a powerful, 50 H.P., truck mounted machine. Readdress any spots or stains that were not fully removed beforehand. Apply carpet protectors (such as Scotchgard) or deoderizers as requested by you, the customer. Groom carpets using carpet rakes to align rug fibers and leave your carpet looking great, if requested.